Snacking on processed foods is something many people find themselves doing, and combined with large portions at mealtimes, it can be easy to overeat. And, if your calorie consumption exceeds the amount of energy you burn, over time, it is possible to gain excess weight. This was an issue Lesley Walker encountered, with her weight gradually creeping up. Having had weight problems as a child, as an adult, Lesley gained more and more weight – with the nature of her job making cooking healthy meals tricky. Working shifts, the ambulance control room supervisor, who is from Inverness, found herself needing the food she ate to be quick and convenient. Often, Lesley, now 40, would find she would have to eat on the go – with a typical day’s meals consisting of a bacon roll, a pre-packed supermarket sandwich, crisps and chocolate, and a large portion of pasta and cheese – as well as more crisps or chocolate, milk, and a fizzy juice. 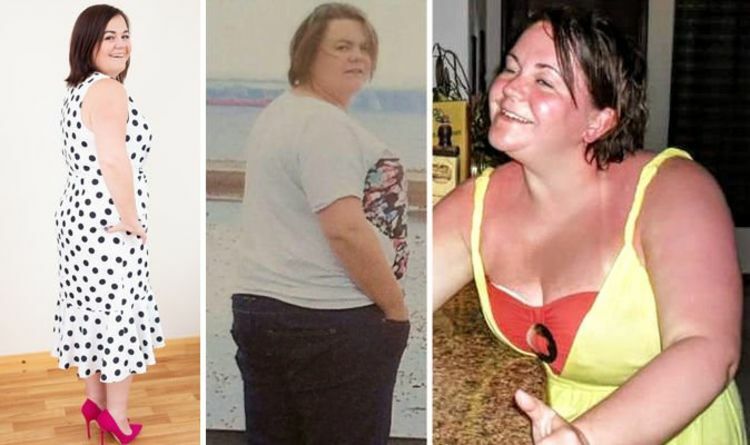 At her heaviest, in 2016, Lesley weighed in at 15 stone and 9lbs. It was then that she decided she had to make a change to her lifestyle. Recalling the moment, Lesley explained she had been lying in bed one night, “feeling pretty fed up, wishing I didn’t have three spare tyres around my middle and stomach”. It was then that she discovered an advert for the Terri Ann 123 plan, with before and after pictures of slimmers grabbing her attention. “Something clicked inside me and I ordered the plan books and had started the plan within a week,” the 40-year-old said. The dietitian-approved diet plan is made up of three different stages, which slimmers switch between on a weekly basis. According to Terri Ann Nunns, these three steps are said to kickstart your weight loss each week. In stage one, dubbed the 10-day boost, users limit intake of starchy carbohydrates and boost the amount of protein, vegetables and healthy fats they consume. Stage two sees participants switch to a diet which does include fruit, and a boosted intake of starchy carbohydrates. Meanwhile, stage three has the aim of keeping weight loss moving, and sees a limit of starchy carbohydrates, while users can still eat fruit. With the new diet plan underway, Lesley soon found herself noticing changes to her weight: losing five pounds within the first four days. “I felt amazing and this spurred me to keep going,” she said. Lesley continued with the diet plan, and after several months she had lost a staggering five stone – as well as dropping four UK dress sizes. She said: “My eating habits have changed completely and I feel amazing. Lesley, who continued to steadily lose weight over the following two years with the help of the diet plan, also began to lead a more active lifestyle.